Ours is a safety culture, no ifs or buts. 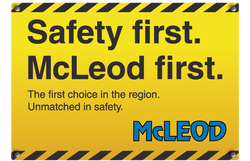 Because safety is always our first priority, we protect customer staff and others as much as our own people. And the fact is, wind can be critical in working out when a job can be done. In most cases, when lifting items, materials or products high into the air the wind needs to be taken into account. If the wind is greater than 19 Knots or 9.8 m/s we recommend looking for an alternate time or contacting us to discuss options. In all cases, no matter the wind speed at the time, our team will stop the lift should weather conditions make the operation unsafe. Every lift is different and the crane operator must take into account the machine in use - its rating charts, setup and the item being lifted including rigging, tag lines and significant hazards - as well as our Standard Operating Procedures and Hazard Register. Everyone gets the benefit of the policy. For further advice on Wind see the Crane Association of New Zealand (Inc.) crane user guideline.